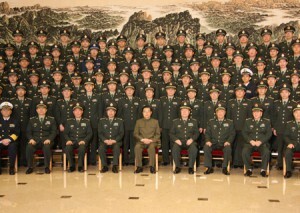 China’s national defense organization. There are in fact two Central Military Commissions; one State and one Party, with identical memberships. Chair: Xi Jinping (since November 2012). Vice Chairs: Generals Xu Qiliang and Zhang Youxia, who are both members of the 19th Politburo. Members: Four further Generals, cut in 2017 from eight, including General Wei Fenghe who is State Councilor and Defence Minister. Also Li Zuocheng, head of joint staff; Miao Hua, responsible for political work and Zhang Shengmin, responsible for discipline commission. Prospects: Xi Jinping is consolidating his control over the military, demanding, and receiving, absolute loyalty. Relevance to Tibet: PLA and PAP play an important role in maintaining “social stability” in Tibet. The CMC can influence national and foreign policy. Vice Chair: PLA General Zhang Youxia (Djang Yo-hsee’ya), born 1950 in Beijing (a Princeling) who is a 19th Politburo Member. Members: General Wei Fenghe, General Li Zuocheng (Chief of Joint Staff), Admiral Miao Hua, Director of the General Political Department and Lieutenant General Zhang Shengmin, Head of the CMC’s Discipline Inspection Commission. The Central Military Commission (CMC) is China’s most powerful military body, comprising the top 6 military chiefs, chaired by the Party’s civilian leader (Xi Jinping). The CMC is the chief conduit through which the military can influence China’s leadership and vice versa. The CMC’s two Vice Chairs have seats on the Politburo. Wikipedia says the CMC “issues directives relating to the People’s Liberation Army (PLA), including senior appointments, troop deployments and arms spending.” The CMC shares authority over the People’s Armed Police (PAP) with the Ministry of Public Security. In October 2017 the Central Military Commission was cut from 10 military leaders (plus Xi), down to six and in November 2017 a new guideline was issued by the CMC calling for total loyalty to Xi Jinping. According to a Xinhua report, the armed forces should be “absolutely loyal, honest and reliable to Xi”. A song titled “Be a good soldier for Chairman Xi” was released by the People’s Armed Police on the same occasion. Xi Jinping’s “anti-graft” campaign has already brought down 100 Generals. One of those promoted to the CMC in 2017, Zhang Shengmin, is the chief of the CMC’s Discipline Inspection Commission, which suggests that the campaign is still a priority. The military has seen a massive restructuring in recent years, creating 15 new departments. Xi Jinping’s corruption crackdown saw the expulsion from the Party of former CMC Vice Chair Xu Caihou and changes in the leadership of the People’s Armed Police (now led by General Wang Ning). In July 2015 another former CMC Vice Chair, General Guo Boxiang, was expelled from the Party and handed over for court martial. One day later, Xi Jinping promoted a further 10 military leaders to the rank of General. These included four that had Tibet experience. In the run-up to the 50th Anniversary of the founding of the “Tibet Autonomous Region” (September 2015) two members of the Central Military Commission visited the TAR: Vice Chair General Zu Qiliang and General Zhang Yang. In April 2013, according to the South China Morning Post, Xi Jinping ordered PLA generals and senior officers to serve as low ranking soldiers for at least two weeks, as a measure designed to “shake up the military and boost morale”. This entry was posted in Profiles and tagged Central Military Commission, China, Chinese Communist Party, People's Liberation Army, Tibet, Xi Jinping. Bookmark the permalink. Dispute with Japan highlights China’s foreign-policy power struggle, by John Pomfrett, Washington Post. This interesting article explores the role of the Military in shaping China’s foreign policy.